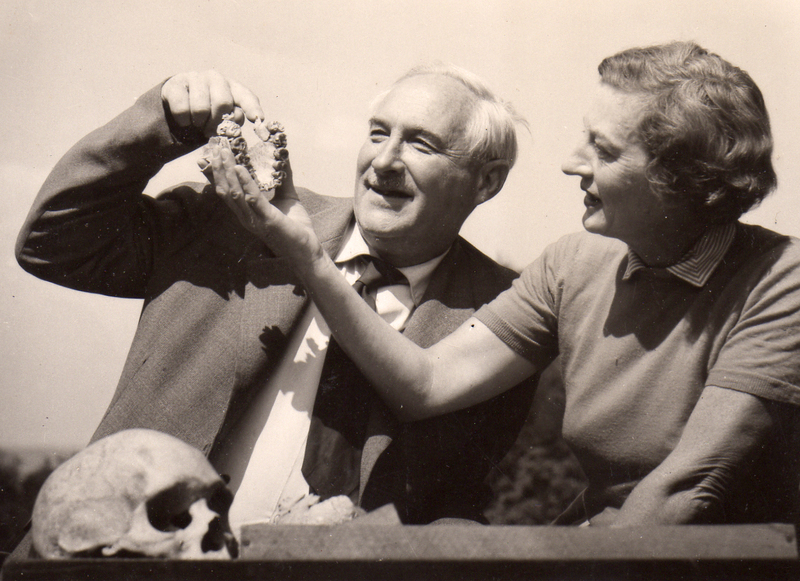 Louis and Mary Leakey examine the palate of "Zinjanthropus." The notion of an African genesis for humankind is widely accepted today, but it was not always so. When Louis Leakey began to search for human fossils in East Africa in the early 1930s he was met with skepticism from his colleagues. Louis and his wife Mary held firm to this belief through decades of exploring sites in Tanzania and Kenya, and in 1959 their faith was vindicated when they uncovered the first of many hominid fossils at Olduvai Gorge. Six decades and three generations later the Leakey family maintains the same commitment to piecing together the story of our origins. They have always believed that sharing and helping to interpret their discoveries with an enthusiastic and interested public is an essential part of their work. In this tradition, Leakey.com is committed to promoting interest and understanding of the human story. In 1903, Louis Seymour Bazett Leakey was born near Nairobi, Kenya, to missionary parents. From the very start Louis felt that our species arose in Africa, a concept we now take for granted. Through his tireless exploration and research, and that of his wife, Mary, son Richard, daughter-in-law Meave, and granddaughter Louise, have unearthed the secrets of our very beginnings and shared these discoveries with an ever-interested world. Louis and Mary Leakey made Olduvai Gorge, located within what is now the famous Serengeti Park in Tanzania, their domain. Since the early 1930s the husband and wife team had scoured the exposures there, determined that eventually evidence for our African genesis would be discovered. For decades they uncovered a plethora of mammal fossils; also many stone tools, evidence that an individuals with some degree of intelligence once inhabited the area, but never a significant hominid fossil. One day in 1959 their luck changed. It was a fragment of bone that caught Mary’s eye, and crouched down in further investigation, after a bit of brushing, she discovered some very hominid-looking teeth with the bone. Excavations ensued, uncovering hundreds of skull fragments which, when reconstructed, would prove without doubt the existence of early hominids in East Africa. Classified Australopithecus boisei, this fossil was knows to Louis and Mary as “Dear Boy.” It seems that finding the first hominid was all it took: two years after the discovery of boisei, Louis’ son Jonathan found a second type of hominid, larger-brained and less robust than the first. Louis believed he had found the makers of Olduvai’s stone tools and named this individual Homo habilis, meaning “man with skill.” Louis’ steadfast conviction was finally vindicated. Our own genus, Homo, had its roots in Africa. These fossils were the first in a long and continually emerging series of spectacular paleoanthropological and archaeological discoveries in East Africa, spanning six decades and three generations of the Leakey family. Mary Leakey continued to work at Olduvai, while his son Richard and his wife Meave started illustrious careers at their own location, Koobi Fora, located in Northern Kenya in the deposits surrounding Lake Turkana. Now their daughter Louise, having recently earned her PhD, has assumed her place in the family business, and represents a new generation of Leakey exploration.